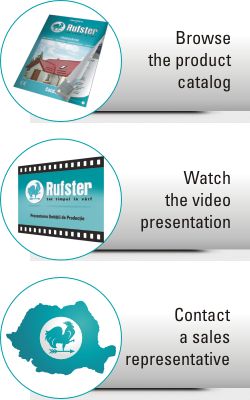 RUFSTER offers a standard color range that can be ordered directly and are available on stock. By request we can also supply other RAL colors. The RUFSTER colors will surely turn your roof of facade in a thing to be admired. The glossy colors will render an ever fresh glistening in any kind of weather while the mat nuances convey an elegant and classical appearance and if you want to stand out you can choose the MPR finish. By request we can also supply other RAL colors.